The growth of the Internet has caused email systems to grow increasingly complex, with spam, phishing and forgery attacks plaguing users globally. Emails are getting stuck in spam filters! Sadly, Netigate survey invitations sent via email is not an exception. DKIM lets an email sender digitally sign an email with a secret key. When the email is received the receiving party can use a publicly available key to validate the authenticity of the sender. This will let the Netigate email server sign all emails as they were sent from your mail servers and allowing any receiver to validate that the emails are not spam. If your organisation supports DKIM you can contact your account manager at Netigate and have him or her turn on the DKIM functionality for your Netigate account. Once DKIM is activated you can access the setup in the Account Settings. In order to add a DKIM key you will need to get help from your IT department. They need to generate a key for you, together with information about what domain and DNS identifier that should be used. Only one key will be actively used at a time but you can add and replace the old one with a new key whenever you want. Insert the full text that form your key. It normally contains some dashes and text specifying what kind of key it is. Paste the entire text in the field. The date from which the key should be active. The date when the key should no longer be used. It is prudent to use if you plan to rotate your organisation’s key with some frequency. How do I generate a DKIM key? There are multiple ways to generate DKIM keys. It can be done directly from your email system. For safety reasons, we recommend you to do it via your own systems and use that information in your Netigate account but if you are unable to do it from your systems you can use a DKIM-key generator. First of all you need to enter the domain name that your organisation is using as <yourdomain.com>. When entered you press “Generate” and wait for the information to be processed by the page. When the page is ready you will see information about a “Private key”, “Public key”. You will need both these to set up DKIM. You need to copy the public key and publish it in your domains DNS. Enter the DKIM settings in you Netigate account and insert the domain name that your organisation is using as <yourdomain.com>. 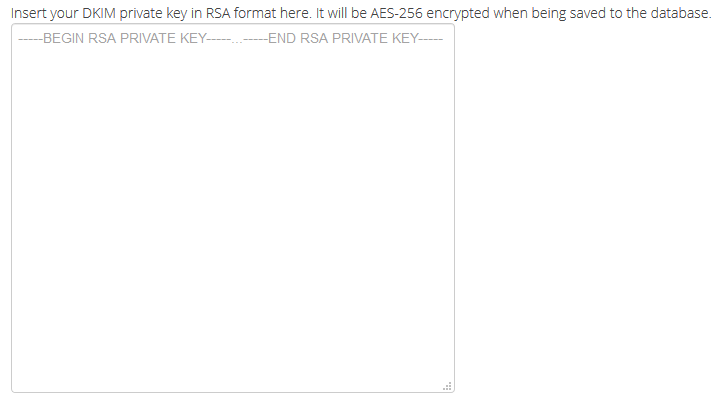 Copy the “Private key” and insert it to the DKIM settings in Netigate. Insert the date from which the key should be active (Start date) and the date when the key should no longer be used (Valid until). It is prudent to use if you plan to rotate your organisation’s key with some frequency. When the settings have been saved to Netigate you need to go back to DKIMCore and click the button “Delete this page” to make sure the information is removed and will not be accessible by anyone.